The Welsummer or Welsumer is a Dutch breed of domestic chicken. It originates in the small village of Welsum, in the eastern Netherlands. 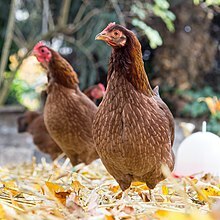 It was bred at the beginning of the twentieth century from local fowls of mixed origin: Rhode Island Reds, Barnevelders, Partridge Leghorns, Cochins, and Wyandottes. In 1922–23, steps were taken to fix a standard after the birds began to show a good deal of uniformity. The eggs were originally exported for the commercial egg trade. Some stock was exported to the United Kingdom, and the breed was added to the British Standard in 1930. Three plumage colours are listed for the Welsumer by the Entente Européenne d’Aviculture et de Cuniculture, of which only one, Red Partridge, is recognised in the Netherlands. Welsumer hens lay about 160 eggs per year; the eggs are dark brown and weigh about 65 grams. Bantam Welsumers lay about 180 dark brown eggs per year, with an average weight of 47 g.
^ a b c Rassetafeln: Welsumer (in German). Bund Deutscher Rassegeflügelzüchter. Accessed September 2014. ^ a b c Rassetafeln: Zwerg-Welsumer (in German). Bund Deutscher Rassegeflügelzüchter. Accessed September 2014. Wikimedia Commons has media related to Welsumer. These are the chicken breeds considered in the Netherlands to be wholly or partly of Dutch origin. Inclusion here does not necessarily imply that a breed is predominantly or exclusively Dutch. This page was last edited on 20 March 2019, at 23:22 (UTC).